It has become a tradition since Lola was born that every Mother's Day we work out in the garden, planting new flowers and starters that Jake and the kids give me. This year, like every other, we will be heading to the local nursery, stalking up on far too many plants and spending the day outside, trying to figure out how to plant everything that we bought. And beyond our yard work, it has always been a laid back day, with not too much planned. Every year Jake asks me if I want to go somewhere, maybe with some friends, or just off by myself. And usually I might take him up on that for an hour or so to grab a coffee in town, but the day has always meant the most to me spent with my family. Now typically, the kids make egg-in-a-holes for my breakfast, but this year I have talked my husband into changing it up a bit. I have always been more of a savory breakfast eater than one going for sweets. Don't get me wrong, I can fully appreciate waffles and pancakes, or especially crepes filled with fresh fruit. But if I had my choice, I'll take something savory, served with really good coffee and a big side of bacon. 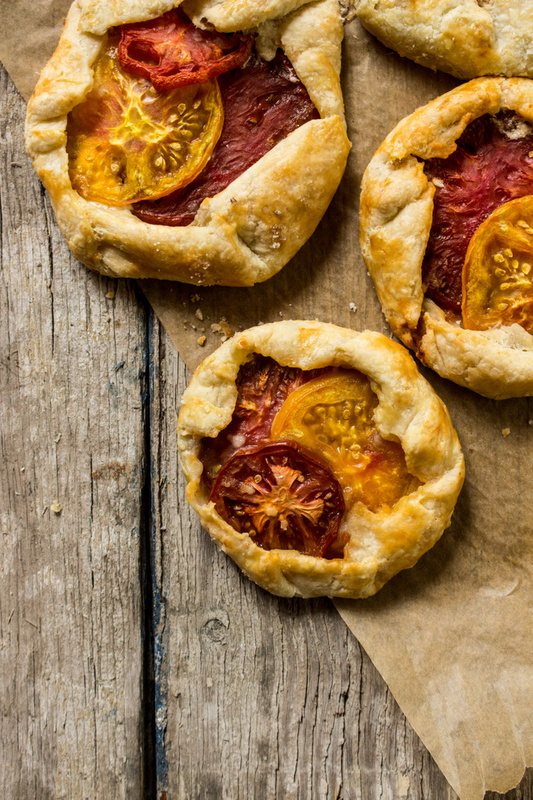 So this year, we are making these really easy, flaky goat cheese tomato galettes. Or here's to hoping. New Seasons Market, a local store in the Pacific Northwest, reached out asking me to share my dream breakfast in bed, and here it is. 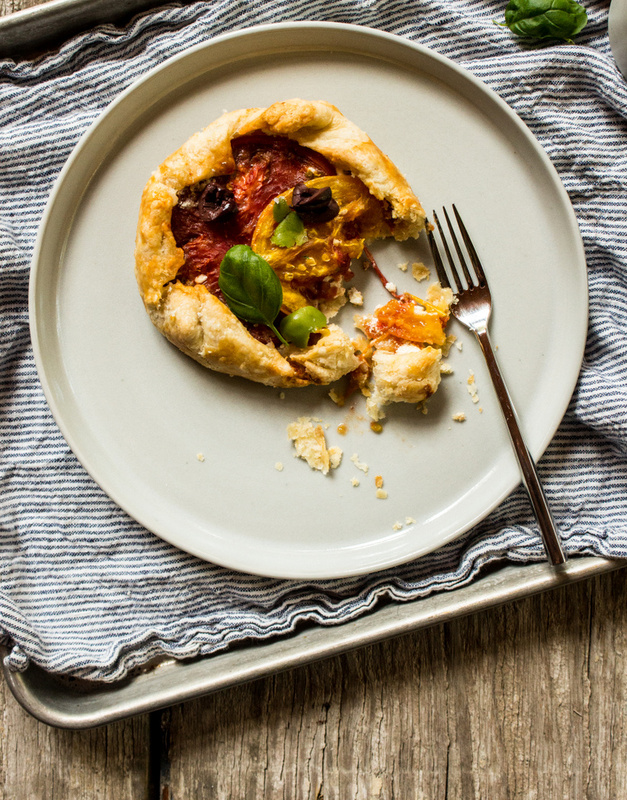 A simple galette filled with goat cheese, heirloom tomatoes, baked until golden and crisp. And then topped with chopped olives, torn basil leaves and flaky salt. I love making galette's and filling them with just about everything. Their imperfections are what make them beautiful. 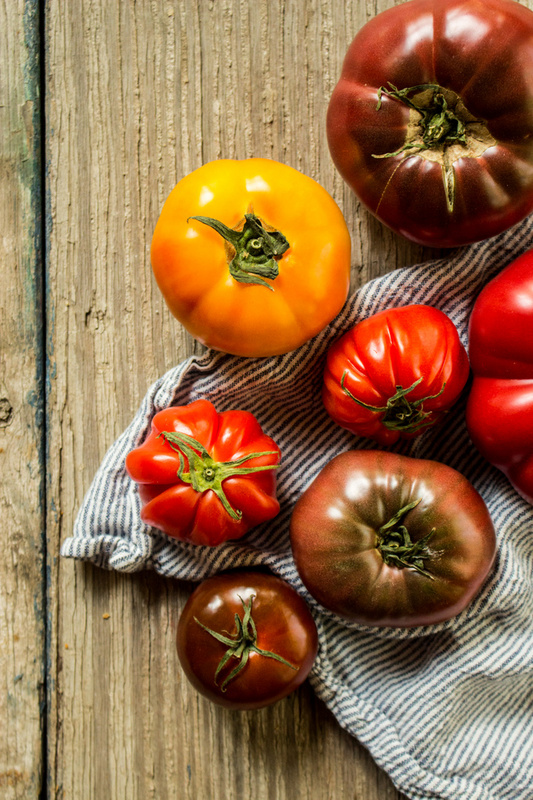 All of the beautiful ingredients for this recipe, including those luscious heirloom tomatoes are from New Seasons Market. And today, we are giving away two $25 gift cards! You can see their locations here. To enter, simply comment below what your dream breakfast in bed is, now through Monday, May 11th. In a food processor, pulse together flour and salt. Add cubed butter and continue to pulse until mixture is coarse with a few small pieces remaining. Pour the mixture into a large bowl and drizzle with ice water. Mix with a wooden spoon until the dough comes together. If needed add 1-2 more tablespoons of ice water. Once the dough has formed, place on a lightly floured surface and knead together a few times. Divide the dough in half and wrap in plastic, forming 2 disks. Chill in the fridge for over an hour. Divide each disk into 4 pieces. On a lightly floured surface, roll out each piece into a circular shape about 4-6". Spread 2 tablespoons of goat cheese onto the dough. Top with 3 slices of tomatoes. Fold edges of dough up and over, pinching the dough as you go around. Brush the edges with egg wash and place on a parchment lined baking sheet. Continue with the remaining dough. Sprinkle the galettes with salt. Bake for 30-40 minutes. Remove from the oven when golden and crisp. Let cool on baking rack. When they are cool to the touch, which makes them easier to slice, top with torn basil leaves and chopped olives. Serve and enjoy!